A friend directed me to InstantDef.com, an interactive ad campaign run by Snickers and featuring a liaison with Black Eyed Peas. The page exhibits gritty graphics and BEP all decked out in what I imagine is gear for the future. They also have a spotted dog that occasionally talks. The website contains five episodes in a drama for which BEP are the protagonists. Granted, I only watched "The Knockout," but one was all I really needed to see. While the graphics are interesting enough, I wasted critical seconds watching background buildings appear in a most snazzy and futuristic manner. When the episode finally loads, we cut to a BEP marginalized by society (kind of the way they are now with the underground hip-hop scene), passing flyers out to a line of fans and demanding that they stay real, save hip-hop, and not buy into the evil lyricist villain Boo-T (the one who's "all about the almighty dollar," according to their spotted dog). At some point a blinged-out midget appears, canes the crap out of BEP's boombox (something I imagine doing every time I hear "My Humps," for example) and destroys a choked-up will.i.am. in a freestyle battle with rhymes like "I got it made, and I'm getting paid, while you're still stuck in the '80's with your hi-top fade." 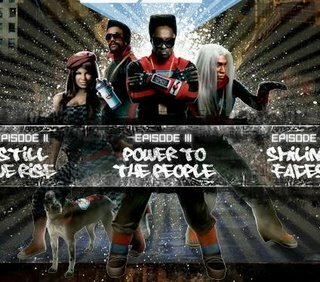 The idea is that by the end of the series Black Eyed Peas, who happen to have super powers donned upon them by an accident at the Snickers plant, improve their wack lyricist skills thereby saving hip-hop from those who would seek to, er, sell out. I hope this is satire. Let's forget for a minute how silly it is to paint Black Eyed Peas as saviours from sell-outs. Will anybody really be won by the exhausted "save hip-hop" rallying cry? That was so late '90's. Snickers, if this is the best you can do, you aren't making your situation any sunnier. One of Those Humiliating Cool-Hunter Moments.